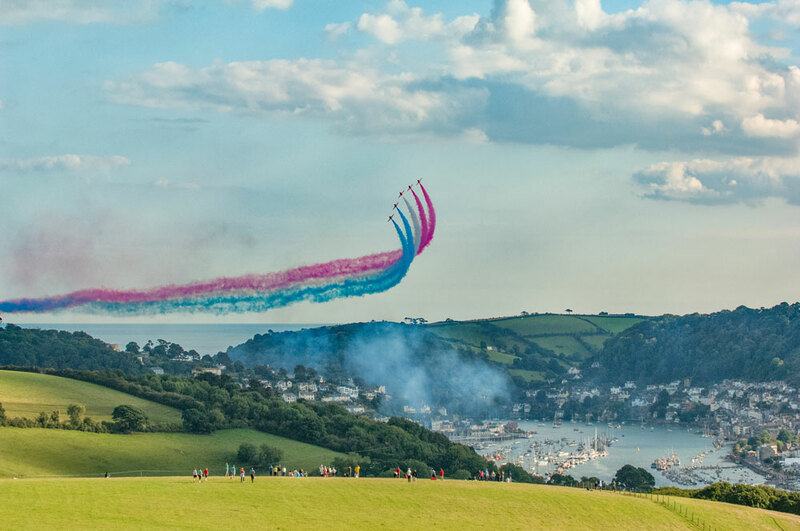 Air displays are always a big part of Dartmouth Regatta and watchers were trilled from their packed vantage points over two days in August 2015. A programme of Air Displays, supported by Exeter Airport, included the Pitts S25 Acrobatic Display, The RAF Typhoon, Battle of Britain Memorial Flight and of course, the nation's favourite, the Red Arrows. At 1815 on Friday 28th August, two Civil Aviation Authority approved flypasts were performed by the Red Arrows display team. In the town on the Embankment, Red 10 gave a live commentary of the display. The Royal Air Force Aerobatic Team, the Red Arrows, is one of the world's premier aerobatic display teams. With a trademark combination of close formations and precision flying, they have been displaying since 1965. All aspects of flying by the Royal Air Force Aerobatic Team – wherever the Red Arrows are operating – is carried out subject to rigorous and well-established aviation safety rules. Representing the speed, agility and precision of the RAF, the team is the public face of the service. They assist in recruiting to the Armed Forces, act as ambassadors for the United Kingdom and promote the best of British. The Red Arrows help more than 500 UK charities every year, supporting a variety of important causes directly and indirectly. Flying distinctive Hawk jets, the team is made up of 120 people including pilots, engineers and essential support staff with frontline, operational experience. Based at RAF Scampton in Lincolnshire, the Red Arrows have flown 4,660 displays in 56 countries, as of the end of 2014 - the Squadron's 50th season.